Finally, a Saturday to myself. And what did I do? 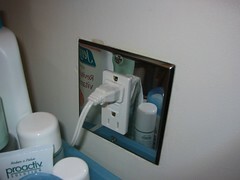 Installed an electrical outlet of course. No zapping myself, no terrible mishaps, not even a broken nail (though there was a lot of cursing for a short period when the back plate wouldn’t line up). …. shouldnt it be the other way around? ground usually is on the bottom. wow you able to do that….I had screaming monkeys in my head for most of the day… what fun I had. Free this weekend? for a bbq? it usually should be the other way around, but my copper wire was closest to the top – so I just decided to install it upside-down.